Recipe and photo by Felicia Scocozza. 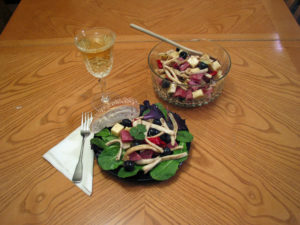 One of the tastiest creatures in the sea is the prime ingredient in this innovative salad created by Felicia Scocozza. Squid, or calamari, if you please, is extremely versatile when it comes to tempting the palette. It can be cut into rings or strips and pan-seared or deep-fried using your favorite seafood batter and seasonings. You can add it to soups or salads, or lightly baste a whole mantle with olive oil before setting it on the barbecue, four minutes per side on medium heat. Some like to pack the mantle with seafood stuffing before roasting it in the oven. To clean squid, twist off the head and place it aside. Next, pinch off the two wing-like fins at the top of the mantle. Work you fingers under the skin and simply peel it away from the firm, white flesh. With a thin fillet knife, scrape the insides loose from the mantle, being sure to remove the plastic-like skeleton. At this point, you can simply slice the mantle cross-wise to create rings, or split the mantle open and then slice into strips as if you were cutting squid for bait. If you want to eat the tentacles, slice them free from the base of the head and then remove the beak-like mouth at the center. Delicious served hot or cold, the fierce-looking squid is a delectable treat with an appealing taste that serves well as an appetizer or main course. The following simple recipe offers a departure from the traditional fried calamari platter. Toss in eight ounces of cooked, chilled tri-color rotini and add an extra quater-cup of dressing to bump this dish from an appetizer to a hearty meal. Prepare squid and toss in one-third cup of balsamic vinaigrette. Refrigerate. Mix together provolone, salami, roasted peppers and artichoke hearts. Refrigerate. Put three tablespoons olive oil in large pan. Add in one-half of the squid and cook on medium-high heat for two minutes. Stir and cook another two to three minutes until the squid turns white and is no longer opaque. Total cooking time should be approximately five minutes. Repeat with remainder of squid. Place cooked squid in a large bowl and add lemon juice, salt, pepper and garlic powder to taste. Add the provolone and salami mixture to the squid. Add one cup of olives and one-quarter cup of dressing. Refrigerate the entire mixture for at least 30 minutes. Serve over baby spinach or mixed greens with a slice of crusty Italian bread. Although delicious when first made, this dish is even better the following day once all the ingredients have spent some time together.